You likely know about cloves—the aromatic spice common in Chinese and Indian culture for both cooking and medicinal purposes. However, cloves can also be converted into a very powerful essential oil with several potential benefits for your health. Unlike other spices, cloves are grown throughout the year; therefore, the health benefits of clove have been more readily available than other medicinal foods. Today, clove essential oil works as a potent dental and gum disease treatment in natural mouthwashes or toothpastes. It could also kill mold, fungus, and parasites; treat skin problems like acne; improve blood circulation; boost energy; and treat and prevent anemia, osteoporosis, and premenstrual syndrome (PMS). What else is there to know about clove essential oil? This article tells the story of this sweet fragrant spice, the benefits of its essential oil, and a few recipes to help best utilize it. What Is Clove Essential Oil? Cloves are the unopened pink flower buds of the evergreen tree, and are native to Indonesia and Madagascar. Clove buds are dried and ground into a powder before they can be used for cooking or can be made into clove essential oil. You can derive three types of clove essential oils from the evergreen tree, including clove bud oil, clove stem oil, and clove leaf oil. It is clove bud oil, or Eugenia caryophyllata, that is the popular essential oil used in aromatherapy. Cloves have a long history within traditional Chinese medicine (TCM). It was used in the Han Dynasty (207 B.C. to 220 A.D.) for bad breath. Throughout the years, TCM used cloves for diarrhea, indigestion, hernias, ringworm, and fungal infections. In the fourth century, cloves arrived in Europe where they were considered a luxury, and were part of a treatment once used for gout. After cloves become more readily available, they were used in ways very similar to TCM. Clove oil was reportedly one of the key essential oils used to protect Europeans from the great bubonic plague in Marseilles in 1722. As the story goes, the king caught a group of robbers, and asked them why they weren’t dead or ill from exposure to the plague. Basically, the thieves were said to be protected after covering themselves all over with an essential oil blend before invading the homes of plague victims. Today, the essential oil blend is known as Thieves oil, and it also contains cinnamon bark, lemon, eucalyptus, and rosemary. What are the health benefits of clove essential oil? Clove oil contains stimulant, libido-boosting, antiviral, disinfectant, antifungal, anti-microorganism, anti-inflammatory, painkilling, rheumatoid arthritis-fighting, immune-boosting, and nerve-calming properties. Clove essential oil benefits are mostly attributed to the chemical constituent eugenol, which makes about 90% of the clove oil. Research published in the Journal of Immunotoxicology found that the eugenol in clove essential oil protects the liver against disease, while also reverses inflammation and cellular oxidation—a key-contributing factor in the aging process. Clove oil was first documented for toothaches in 1640; however, the Chinese are thought to have been using it for more than 2,000 years. Today, clove is widely considered a reliable treatment for pain and discomfort from various dental and gum diseases. Clove oil also creates a numbing sensation as a potent pain reliever for gum and tooth pain. A study published in the Journal of Dentistry in 2006 found that clove essential oil has a similar numbing effect to the topical agent benzocaine, which is often used before inserting needles in the mouth. Another study from the Indian Department of Public Health Dentistry found that clove oil would significantly slow dental erosion better than fluoride. It was even observed that the clove essential oil remineralized teeth. Cloves and clove essential oil may be very good at fighting candida. A study published in the journal Oral Microbiology & Immunology once found that clove was as effective as a common yeast mouth infection drug called nystatin, which has numerous side effects like diarrhea and vomiting. In addition, clove oil can help kill intestinal parasites, and is often part of short-term parasite and candida cleanses. Have a sore throat or cough? Clove essential oil may help save the day. A study published in the journal Phytotherapy Research in 2007 observed the antimicrobial effects of clove oil against a number of multi-resistant bacteria. When you have a cough or sore throat, it is also a good idea to chew on a clove bud. Clove oil is added to many insect repellents, dental products, foods, perfumes, and also pharmaceutical products. 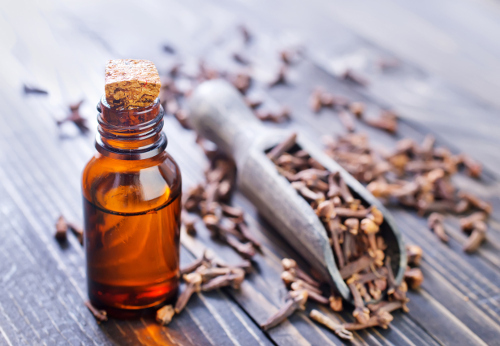 The purported stimulating and warming properties of clove oil make it a popular choice in aromatherapy. Besides the oils from the Thieves oil blend, clove essential oil also blends well with bergamot, basil, clary sage, lavender, grapefruit, orange, rose, ylang ylang, and peppermint essential oils. Add a drop to toothpaste, or directly to the gums or teeth, for promoting oral health. Also, add a drop to a large glass water bottle, and use as a natural mouthwash. For boosting immunity, add a drop to a veggie capsule, and take daily in the winter months to prevent a cold or flu. Diffusing clove oil throughout a room also helps promote courage and boundaries. Also, massage clove oil over the liver or feet to promote detoxification. Directions: Combine all ingredients together in a two-ounce bottle, and transfer to a sterilized 15ml dark-glass bottle, and seal with a dropper or cap. Directions: Combine all ingredients together in a two-ounce bottle, and transfer to a sterilized dark-glass bottle, and seal with a dropper or cap. The mixture will keep for about three months when stored in a cool, dark place. Directions: Combine all ingredients together in a bowl, and transfer to a sterilized small glass jar. Gently rub oil blend into gums, and rinse mouth with water. Clove oil is one of the powerful essential oils you can have part of your collection. That being said, it is important to note that excessive use of any essential oil can lead to skin sensitization; therefore, it is best to keep out of the nose, ears, or eyes. It is a good idea to perform a skin sensitivity test with clove oil before using it throughout the body. Also, remember that not all essential oils are created equal. It is best to purchase 100% pure therapeutic grade clove oil from reputable essential oil companies. Also, consult your doctor before using clove oil when pregnant or breastfeeding. Children should also avoid clove oil due to potential stomach discomfort. “Clove Bud Essential Oil: Uses, Benefits, and Precautions,” sustainable baby steps; http://www.sustainablebabysteps.com/clove-essential-oil.html, last accessed April 28, 2017. “How to Use Essential Oils with Four Applications Methods,” sustainable baby steps; http://www.sustainablebabysteps.com/how-to-use-essential-oils.html, last accessed April 28, 2017. “Choose Clove Bud Oil for Better Dental Health,” Mercola, Feb. 2, 2017; http://articles.mercola.com/herbal-oils/clove-bud-oil.aspx. “Clove,” doTERRA; https://doterra.com/US/en/p/clove-oil, last accessed April 28, 2017. “Clove Oil Uses—Supports Healthy Immune System,” Experience-Essential-Oils; http://www.experience-essential-oils.com/clove-oil-uses.html, last accessed April 28, 2017. “Clove,” Daniele Ryman; http://aromatherapybible.com/clove/, last accessed April 28, 2017. “23 Surprising Benefits of Clove Oil,” Organic Facts; https://www.organicfacts.net/health-benefits/essential-oils/health-benefits-of-clove-oil.html, last accessed April 28, 2017. “20 Ways to Benefit from Clove Essential Oil,” Backdoor Survival; http://www.backdoorsurvival.com/20-ways-to-benefit-from-clove-essential-oil/, last accessed April 28, 2017.